So, as I wonder through kitchen after kitchen for divine inspiration… I had to share! First I have to admit, that no… I am not a really good cook. I actually hate to cook, the idea of dirtying up dishes only to have to wash them too…well, it’s not high on my priority list. LOL. HOWEVER, if you have a kitchen like any of these….how do you NOT cook! 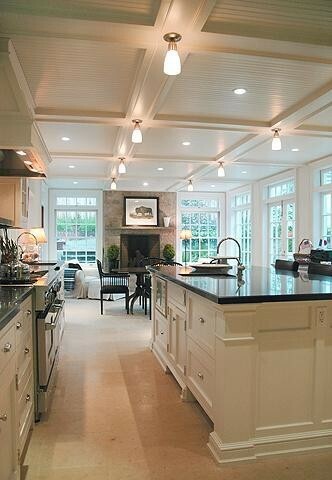 I simply adore coffered ceilings…and then put that with tongue and groove! OH…i’m in the floor! The only way to even take this a little more over the edge is to paint it the haint blue color! In case you don’t know anything about “haint” blue, in southern areas like Savannah, Charleston, etc, people painted their ceilings on their porches this color because it would keep evil spirits away! Totally adorable. 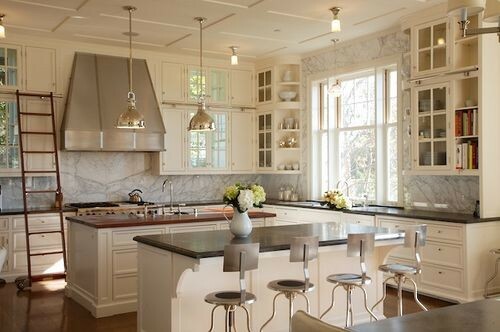 As you’ll notice, I’m also fascinated with white cabinetry. There is just something about the crispness that I could eat! In the next image, again we have a coffered ceiling with the tongue and groove yet again, but I love how they placed the lights and the intersection of the coffered panels. I love how the lines take your eyes to the beautiful stackstone fireplace! What a wonderful hearthroom! Aside from that, can we discuss all the windows and french doors with transoms! Of course, you would have to have a back yard to look at….but I would be fine looking at weeds if my kitchen/hearthroom looked like that! When it comes to cabinets, I like Shaker style doors. The simpler the better! I would rather have fab handles or pulls! But of course we also can’t forget about the sink! There’ll be no stainless steel sink for me@! OH NO!!! Look at these porcelain apron sinks! OH……once again I’m in the floor! 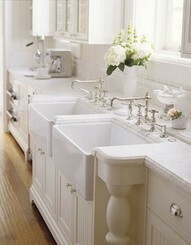 What I also love about these sinks, is that they actually look like they are a part of a piece of furniture! Look at those “turned leg” details! Edible I tell you! Also note the silver pulls. I simply love those! I have those in my kitchen now, but they just don’t look as good as these! Last, but NOT LEAST. There is so much about this last kitchen I don’t know where to start! I love EVERYTHING about this one! I love the classic detail with modern details! The bar stools are part of my favorite details. A modern take on a vintage look! The one thing I’m a little concerned about though is….do you really need two islands? I mean…as little as I cook….I don’t even think I would use 1 to it’s fullest purpose! Regardless, I guess I can dream of kitchens to be had. Poor Maxine (my realtor)…you have your work set out for you!